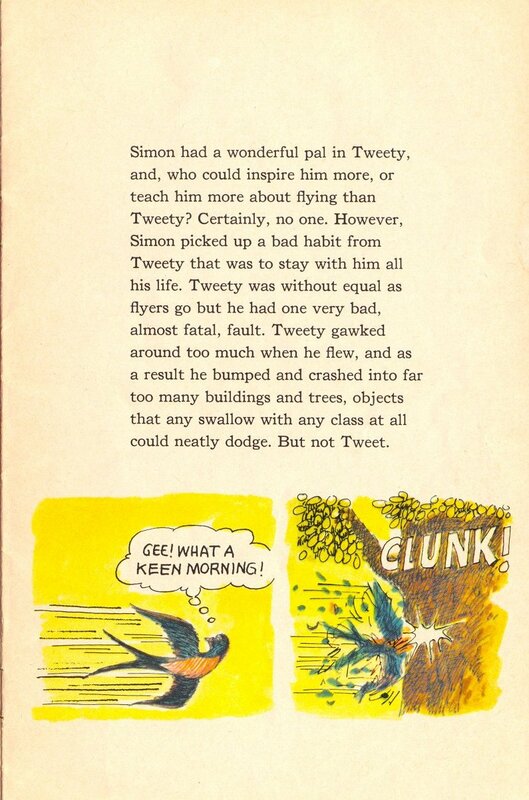 Simon had a wonderful pal in Tweety, and, who could inspire him more, or teach him more about flying than Tweety? Certainly, no one. However, Simon picked up a bad habit from Tweety that was to stay with him all his life. Tweety was without equal as flyers go but he had one very bad, almost fatal, fault. Tweety gawked around too much when he flew, and as a result he bumped and crashed into far too many buildings and trees, objects that any swallow with any class at all could neatly dodge. But not Tweet.